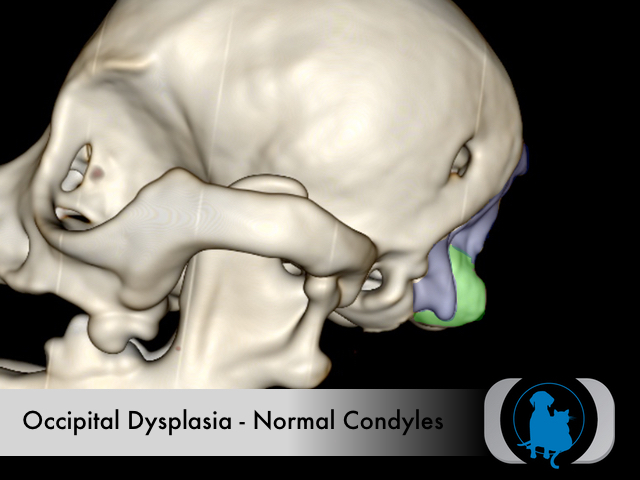 Occipital dysplasia is a congenital abnormality of the formation of the occipital bones of the cranium. The most common manifestation of this condition is an underdeveloped occipital bone leading to a dorsoventrally enlarged ("keyhole shaped") foramen magnum. In patients with this condition the normal occipital bone is replaced by a fibrous tissue membrane that covers the caudal surface of the cerebellum. Occipital dysplasia is a developmental condition that is the result of breeding efforts to achieve a "desirable" phenotypic appearance irrespective of the pathophysiologic consequences. The condition is more common in small and/or toy breed dogs including the Yorkshire Terrier, Pomeranian, Maltese Terrier, Chihuahuas, Pekingese, as well as in Miniature and Toy Poodle, Miniature Keeshond, and Beagle. 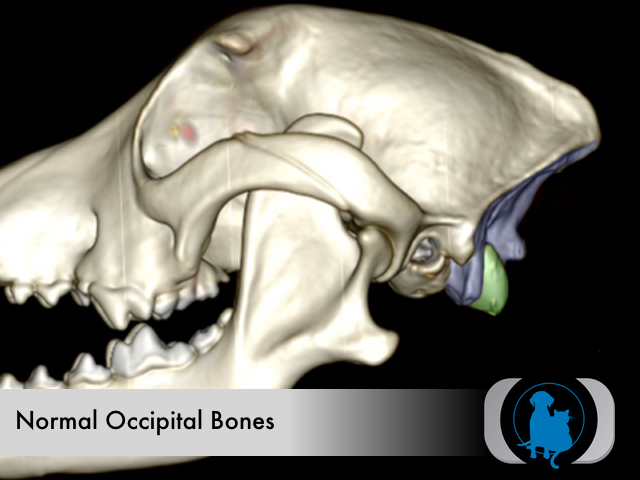 The majority of dogs with occipital dysplasia as a solitary condition are not symptomatic. 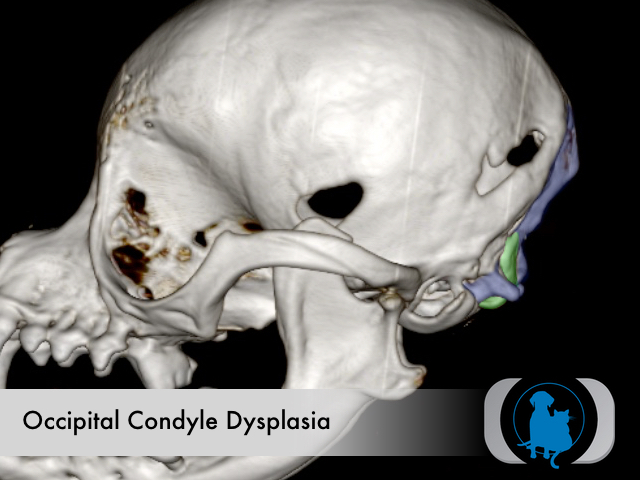 However, occipital dysplasia can result in the underdevelopment of the occipital condyles that form the basis for the connection between the skull and the cervical spine. When the occipital condyles are sufficiently underdeveloped, the integrity of the connection between the skull and the cervical spine may be compromised leading to clinical signs secondary to cranial cervical spinal cord compression that range from pain to paresis and even paralysis. 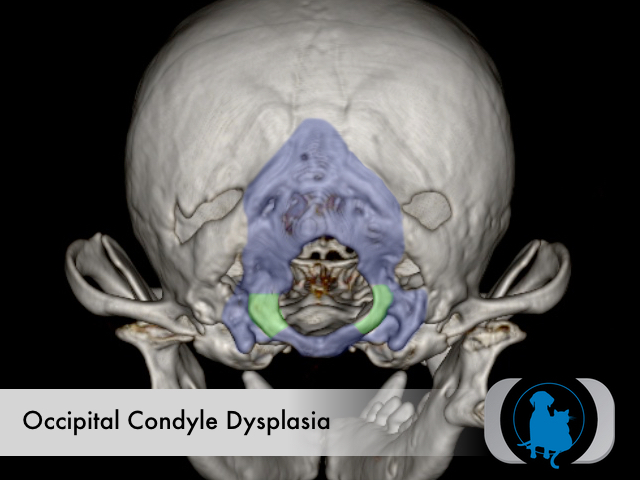 Occipital dysplasia can often be diagnosed with plain skull radiographs however, advanced diagnostic imaging modalities including both MRI and CT are indicated to evaluate the impact of the bony changes on the underlying central nervous system structures. 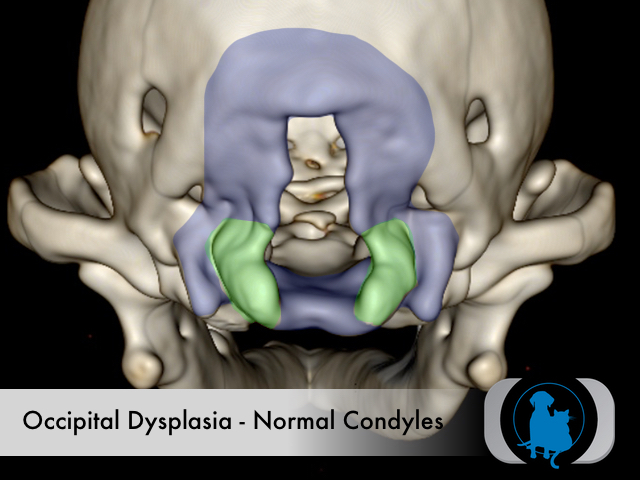 Most cases of occipital dysplasia that lead to enlargement of the foramen magnum alone, do not require any therapy. Cases with occipital condyle dysplasia may demonstrate a clinical atlanto-occipital subluxation that results in symptoms from spinal cord compression at this level and may benefit from surgical intervention. 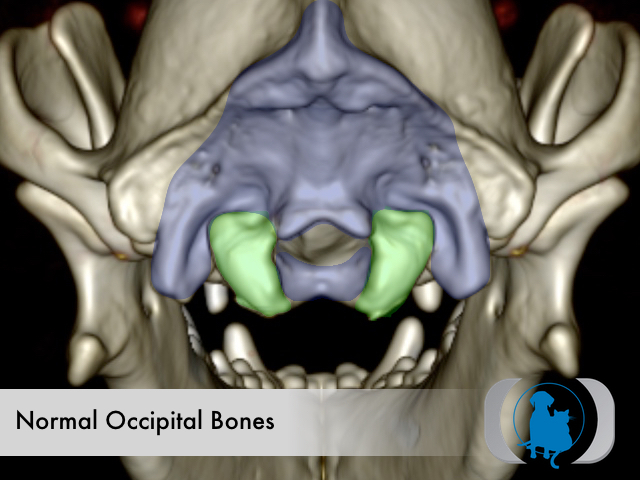 3D volume reformat of a canine skull with normal occipital bones (color overlays). The occipital condyles (green overlay) are the convex protuberances of the occipital bone that forms the cranial surface of the joint with the 1st cervical vertebra (i.e., atlas). 3D volume reformat of a CT of skull of a dog with occipital dysplasia (dorsoventrally elongated foramen magnum or "keyhole" foramen) and relatively normal occipital condyles (green overlay). 3D volume reformat of a CT of skull of a dog with occipital dysplasia (dorsoventrally elongated foramen magnum or "keyhole" foramen) and markedly attenuated occipital condyles (green overlay).